Radical Heights has a new update available and it includes plenty of items to make your character look the coolest of the cool. 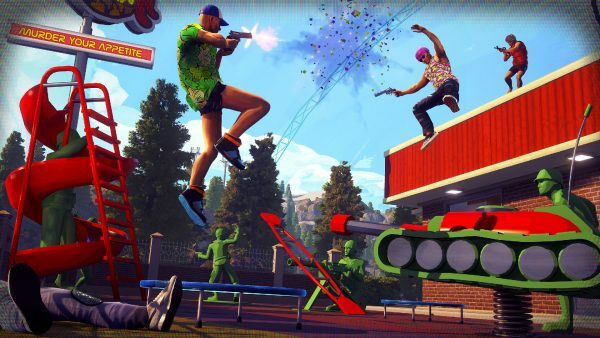 Patch 2 for Boss Key Productions’ battle royale title Radical Heights is available. It includes the usual fixes and improvements that come with patches, but there are some neat new items available as well. The scanner is the newest gadget in town, and it temporarily shows the last known location of an enemy within a certain radius. Players can now show off their BMX skills on new bike ramps added to various locations on the Radical Heights map. There are also 32 new new cosmetic items available such as hairstyles, dances and threads. The patch also consolidates the customization options to the Prize Room. This is a one stop spot allowing folks to customize their contestant and Kill card. Easy peasy. Below you will find the full notes for patch 2. As with all early access title patches, there are some known issues. Be sure to check the list out here in case you run into any problems. The free-to-play, battle royale game is currently in early access on Steam. If you’re still unfamiliar with it, we have a few answers to common questions regarding Radical Heights through the link. Performance optimizations when switching to and from aim down sight or scope view. Duos: Fixed parties disbanding after each match. General performance optimizations ongoing – players should see increased FPS. Improved ATM interaction: You can now queue as much money as you want to withdraw or deposit. Art pass started on locations that were previously only greybox. You can now rotate your character in the menu by clicking and dragging. Reduced the range you can hear the supply line. Zip lines can be grabbed from any point, instead of just the start. New animations for healing/eating burgers in prone and crouch. Prize Room: All customization options have been merged into the Prize Room. This now displays both owned and unlockable items. There is now a sort option for “owned” items. Increased pitch up/down air control. Easier to stop spinning/flipping in air. Curbs and bumps won’t flip/spin the bike as much. Variable jump height: tap for a small jump to avoid small obstacles or hold & release for a fully charged jump. Lots of ramps added to the world to do sick flips on! New Gadget: Scanner – This gadget scans enemies in a large radius around the player. Enemies detected have their location at the time they were scanned revealed on the player’s mini map temporarily.